The Walking Dead still has several more episodes in its third season, but just because we’re not finished with this round of episodes doesn’t mean we can’t jump ahead in the future, right? Hey, I’m game if you’re game. At PaleyFest 2013, producers of the show revealed some little nuggets of knowledge that are sure to get any Walking Dead fan excited for the upcoming season. Many people were concerned during previous season that there was too much walking around and not enough zombie-fighting-action, but it sounds like the showrunners will really be working toward developing characters in full ways and stray away from the “run and gun” way of doing things — which some people might not love. But it’s going to happen. So prepare. 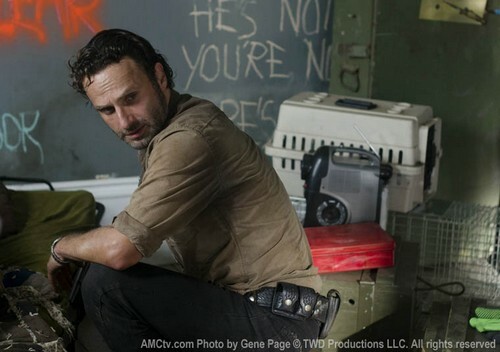 Executive Producer Steve Nicotero tells Entertainment Weekly: “I think there may be a wee bit less of the run and gun. And [we’ll] get a little more into some of our characters. The challenge with a show like this, when you have a big ensemble, is you don’t want any of the characters to get lost; it’s important that we know what Carol’s story is and that we know what Beth’s story is. And when you’re trying to service a lot of characters, it becomes challenging. I think these are valid observations and will be important to address if the show is to have a long and lasting career. You can only tell so much story with flat characters running around chopping off zombie heads. But if you work to establish each character, make them round and fully three-dimensional, then you’ll be able to run them around and chop off zombie heads for many more seasons to come! We also learned that Rick won’t stay super crazy forever — he’s going to turn it around soon — and Andrea more than likely does not have feelings for the Governor anymore. Good, because he’s crazysauce. Do you follow The Walking Dead? If so, tell us what you love about the show in the comments section below!